Five patch quilt block patterns are versatile designs made up of twenty-five squares, five across and five down. The squares are often divided into smaller units to create more intricate patchwork, but additional grids aren't added quite as often as they are in nine patch blocks and four patch blocks. This list of five patch patterns includes some of my favorites, but you'll find more in my quilt block patterns gallery and in patterns for entire quilts. Use strip piecing techniques to make assembling the Album quilt block a breeze. It's a large block -- 15" square -- so it doesn't take many quilt blocks to cover a bed. My example focuses on just a few colors, but the design can look very different when you work with multiple colors and alter the placement of dark and light fabrics. Such an easy quilt block! 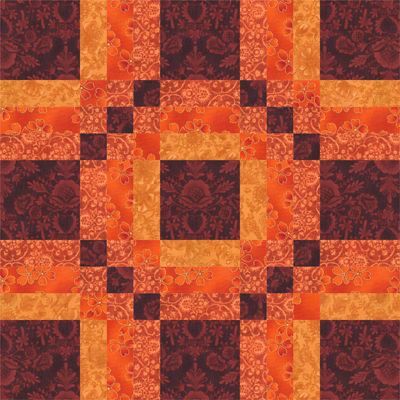 Offset squares is a strip pieced block, and the straight grain edges of its patches make it a breeze to sew. I think this design makes a wonderful scrap quilt, but like any other layout, it's just as effective sewn in an orderly color arrangement. I made this Grape Basket quilt block to resemble a design on a quilt barn. We don't have as many quilt barn trails in western North Carolina as I'd like, but the trails that we do have are fun to drive -- a drive through the mountains is always welcome. Not the wedding ring design you're accustomed to seeing, but an easy version that's suitable for all quilters, beginning to experienced. The block is made up of squares and half square triangle units. Sew it with just a few fabrics, like the block on the left, or go entirely scrappy with the layout. Country Roads is a five patch quilt block with four patch units at its corners that are separated by central bars. An easy block, the patchwork goes together in no time at all. I've written three Lady of the Lake quilt block and quilt patterns, and this is the five patch version. It's a block that's traditionally sewn in just two colors, switching them from side to side, but don't feel you must conform to that standard because it's fun to experiment with layouts. Your choice of color value (contrast) can dramatically alter the Greek Cross quilt block, and I've included drawings to illustrate some of the variations. I included a quilt layout example, too, with yardages and assembly instructions. Sew this block in a traditional style, or make it appear more contemporary by choosing different of fabrics. I love chain quilt blocks because they link to each other and offer all sorts of layout possibilities. Chains make excellent alternate blocks, even with something as simple as a Snowball. Get creative with chain blocks and take them in any direction that suits your needs. Fooled you! Maybe. 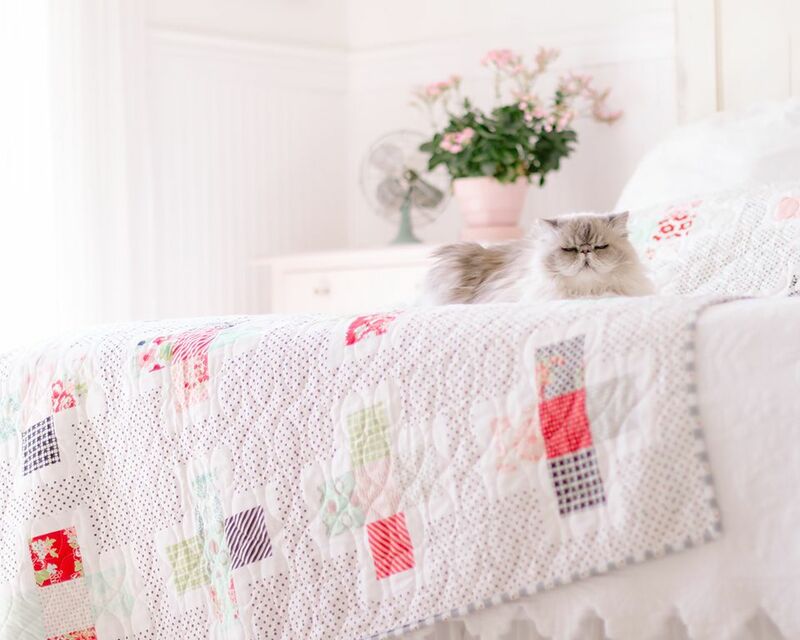 At first glance, Premium Star looks like a couple of other traditional patchwork quilt blocks, including the Bear's Paw, which has fewer half square triangle units in each corner, and a more narrow bar separating those corners. Browse the indexes to find more quilt blocks of all types.